The California garden snail, <em>Helix aspersa</em>: elegant, tasty, and destructive. You’ll probably see them after a rainy evening, making their way up from shrubs and ivy onto the stucco walls of buildings. Or, if you’re a gardener, you may angrily discover signs of their feasts from the previous night: lettuce chewed up, strawberries with small bites missing, or your favorite flowers with hole-ridden leaves. The California brown garden snail, otherwise known as the European brown snail or, scientifically, the mollusk Helix (Cryptomphalus) aspersa M¼ller, was not always so despised as it now is in this state. It is thought that Helix aspersa was first intentionally introduced into California by the French in the 1850s as a source of food: the delicacy escargot. Heliciculture, or snail farming, actually has very ancient ties to human history. Roasted snail shells, including those of our friend Helix aspersa, have been found at prehistoric archeological human sites, over 10,000 years old, in the Mediterranean. These early remains are most likely from foraging for these tasty mollusks, and not actual systematic farming. Relatively more recently, some 2,000 years ago, the Romans were known to have delicately maintained “snail gardens,” fattening different species of snails and selectively breeding them for flavor. Helix aspersa is especially easy to farm because of its adaptability to different climates and conditions. Careful preparation is required, however, as the contents of their intestines are actually naturally toxic to humans. Snail farmers must put the snails through a careful purging process over a few days, a process you should be sure to read up on before attempting to prepare home-made escargot! Although it certainly seems to prefer California’s temperate weather, Helix aspersa‘s natural habitat spans Western Europe and the Mediterranean. Aside from the United States, Helix aspersa now calls many other countries its home, including Africa, New Zealand, Mexico, and Argentina. California provides very good reproduction conditions for Helix aspersa. Like many snails, they are hermaphrodites, meaning each individual has both male and female reproductive organs, although they must still mate with one another to reproduce. In less ideal climates, they breed in the late spring or early summer, but in humid, tropical climates they can breed year-round, up to five times a year, and can even store extra sperm for up to a year in case they do not find another mate. The snails dig small holes in moist, soft dirt for a nest and lay around 80 eggs, buried about one inch deep. The eggs hatch a few weeks later, and the newborn snails take one to two years to mature, but can then repeat the process again, potentially parenting many more snails in their two-to-five year lifespan. 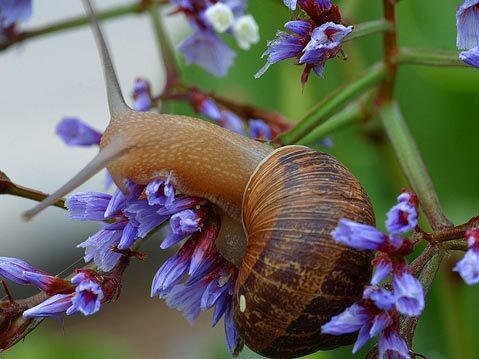 Though it is difficult to calculate the exact costs that Helix aspersa inflicts upon California home gardeners and commercial companies, the estimates are $7 to $10 million annually. Most of the damage is done to commercial citrus crops, although other crops, such as ornamentals, suffer too. Anyone with a backyard garden can tell you that the snails do plenty of damage to their plants as well. Aside from pesticides, other, more “natural” snail deterrents are used, such as garlic, wormwood solutions, and copper; banding copper around a tree trunk can prevent snails from climbing up it. While the devastation of Helix aspersa to California crops may appear great, it could be much worse. The giant African land snail, or Achatina fulica, is often sold as a pet in Europe, though it is illegal to have one in the United States. Reaching a maximum height of nearly three inches and a length of almost eight inches, these snails are one of the largest land snails in the world. There have been outbreaks of these monster mollusks in the United States previously, such as in Florida in the 1960s when a boy let three of his pet snails go free; within seven years there were around 18,000 of their progeny devouring the wilds of Florida. After seeing the damage done by the relatively tiny California brown garden snail, we can only hope Achatina fulica won’t find its way to California and settle down for a feast. For further reading on snails, see Andy Becker’s “Adventures in Snail Hunting”; Escargot.